She's been teasing it for weeks. Now it's here! Yes, we have the first trailer for Chloe Moretz's YA sci-fi thriller adaptation The 5th Wave. And it's sure to please fans of The Maze Runner, Divergent and The Hunger Games. Based on the popular Rick Yancey novel of the same name, Chloe Moretz stars as a young woman whose world is being torn apart by aliens from another galaxy! After a string of successful dramas and thrillers, The 5th Wave arrives as Chloe Moretz's first dystopian YA adaptation, which definitely has a lot of franchise potential. The book is the first in a trilogy, which seems to be the norm nowadays. Starring alongside the young fan favorite are Ron Livingston and Maggie Siff as Cassie's parents. Alex Roe and Nick Robinson play the young woman's two potential love interests. In the novel, Cassie finds her world torn apart by invading alien forces. These Aliens attack Earth in 5 waves, the 1st wave being a permanent blackout of power, setting earth back into the Stone Age. The 2nd wave being a massive tsunami, killing off all coastal cities. The 3rd wave being a plague caused by birds, leaving only the unlucky alive. The 4th wave being humans with activated alien brains. And what's The 5th Wave? Well that's what Cassie Sullivan wants to know. As she goes to fulfill a promise she'd made, to return to her brother, she meets Evan Walker, a strange but beautiful boy with a secret he won't tell her. But the closer she gets with Evan the closer she gets to getting her brother and unraveling the secrets of The 5th Wave. As you can tell by the subtitles, this The 5th Wave trailer was made for international audiences. We don't yet know when we'll get the first official domestic trailer for The 5th Wave, but you can expect to see some of these same scenes. What do you think? 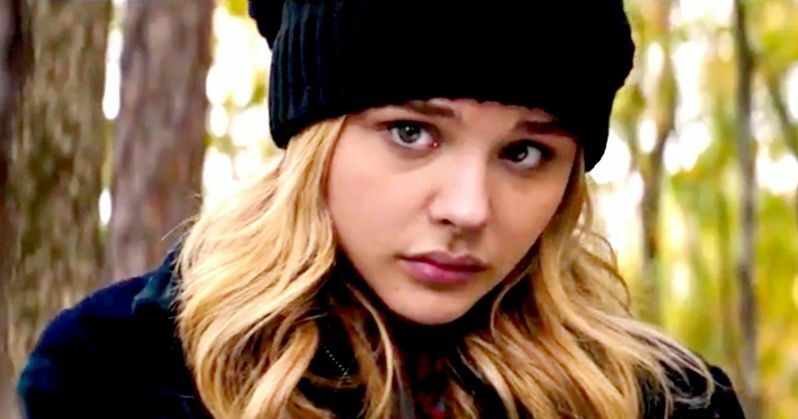 Does Chloe Moretz have the goods to carry her own apocalyptic teen thriller into the future? Or will this latest YA adaptation hit like The Host and disappear from theaters quickly? Let us know what you think. The movie hits theaters everywhere this winter.